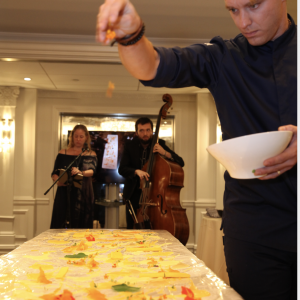 While traveling between New York City and the Netherlands, Pastry Chef ChocoTed and Jazz singer Vivienne Aerts will invite you to a beautiful venue and present amazing new dishes, tickling flavors and swinging music. 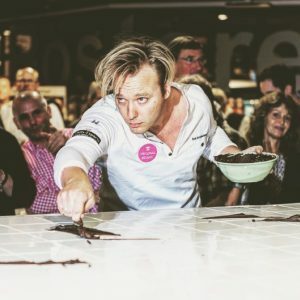 An event full of Jazz and Chocolate. Submerge yourself in the experience of cool jazz clubs and the hottest restaurants. For the NHK Japan show “Catch! 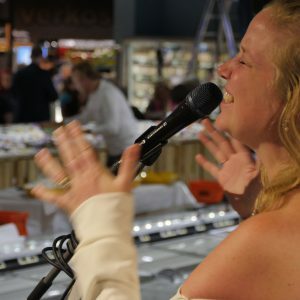 The World’s Top News” we were filmed while going to the galleries, enjoying some art, at the Market in the Bronx, picking up some microgreens from Koppert Cress, in our home on our big blue couch and yes, during our show at Der Pioneer in Brooklyn. The result was a 6-minute feature that has been aired on January 15th and viewed by 13 million viewers on Japanese television. We want to thank all our friends as well as Bjorn and Greg from Der Pioneer, Original Beans, Le Nouveau Chef, Koppert Cress, and Catalonia Plates and of course Shiho from NHK – catch. Click here to view the piece. 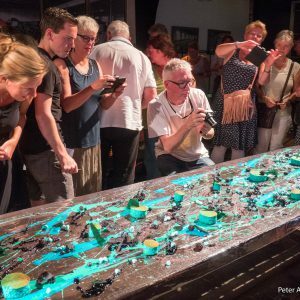 On September 16th we made the enormous ChocoJazz painting at the Zur Heide Gourmet Festival in Dusseldorf. 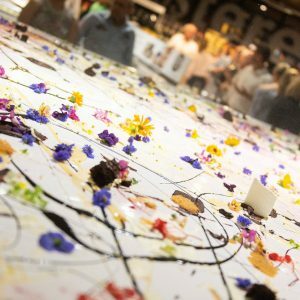 The canvas/table of 40m2 was filled with Chocolate from Original Beans, cake, cream, gel, flowers from Keltenhof, Microgreens from Koppert Cress and was accompanied by sounds from Vivienne, using voice, iPad App, loop station and Florian Weber on samples and Steinway piano. After one hour of painting and music, it was consumed by 1500 people. Even though the Guinness Book of Records didn’t show up, we can officially say that we made the largest pastry painting in the world. Read here the blog. 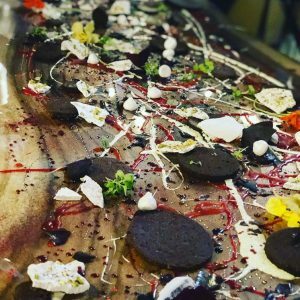 A night to indulge in: The twenty-course dessert menu stands out from every other dessert experience you have ever tasted. 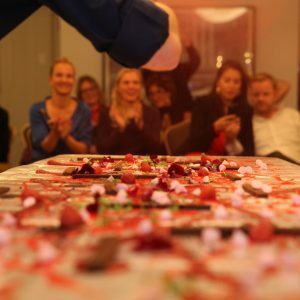 A showcase of conceptual bites that combine classic desserts, haute cuisine dessert techniques, and desserts that are made with techniques from a savory kitchen. Inspired by John Coltrane, the menu feels overwhelming as much as it has a natural flow…In ten staggering ‘movements’ The courses will pass by, rather an opera than a restaurant. A unique ChocoJazz show in the theme of Mondrian and De Stijl, all about colors and elements: red, yellow, blue, and black & white. With every edible canvas, Vivienne and Ted will explain through diverse other painters what they have in common with Mondrian and De Stijl. Vocal jazz and a string ensemble compliment the sweet interpretations of the master’s paintings. All culinary one-bites are based on art, emotions, and music and are driven by haute cuisine techniques. Don’t expect only chocolate, but also cake, coffee foam, cardamom gel, infused rosewater, amarena-cherries blanched in port wine, hibiscus crumbles and other explosions in your mouth. And, while Ted is filling the evening with his goodies, Vivienne mixes her original compositions with the electronic inventiveness from Dutch bass player Robin Koerts. 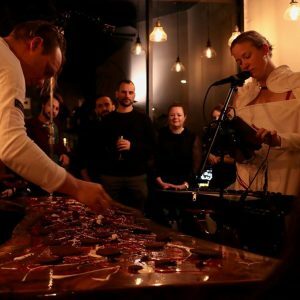 Together they are combining jazz, live loops, visuals, and soundbites. The efforts of Robin, who is also known from the video-samples of the Wereld Draait Door (a Dutch tv-show), and Vivienne’s vocal jazz songs (with voice, loops, iPad apps and synthesizer) blend together in this new musical concept. Video fragments like youtube drummers, tennis players, didgeridoos, the Simpsons, and Wally, with their visuals ánd their sounds, are all part of the compositions.